Sportspeople have long played a role in standing up against inequalities and highlighting social injustice. We can see this through the work of Show Racism the Red Card and also, the high profile Take the Knee actions throughout the NFL in the USA. 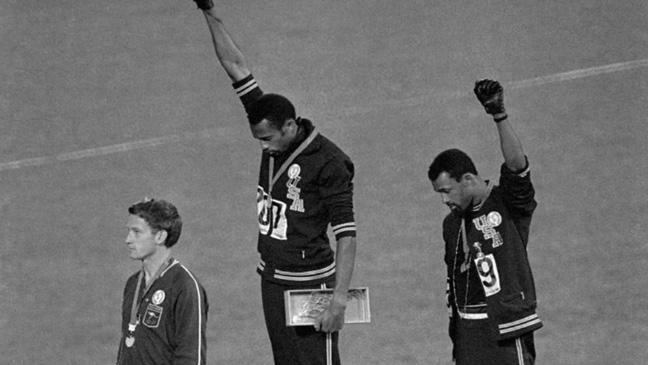 The clenched fist Salute of solidarity by Tommie Smith and John Carlos at the 1968 Mexico Olympics was an iconic moment in the USA Civil Rights movement. The photo of the three athletes on the winning podium has provided us with an image that has crossed generations and continues to permeate popular and political culture as a call to arms. ‘Salute’ is the documentary feature which provides insight into the moment when two Black American athletes protest racism, the war in Vietnam and Civil Rights. But what is not common knowledge is the role of Australian Peter Norman, the third man on the podium. The film focuses on Norman, who showed his support for Tommie Smith and John Carlos by donning an "Olympic Project for Human Rights" (OPHR) badge on his way to the podium. It was also Norman who suggested to Smith and Carlos that they share the black gloves used in their salute, after Carlos had left his gloves in the Olympic Village. This is the reason for Smith raising his right fist, while Carlos raised his left. Asked later about his support of Smith and Carlos' cause by the world's press, Norman said he opposed his country's government's White Australia policy. The film documents the subsequent reprimand of Norman by the Australian Olympic authorities, and his ostracism by the Australian media. Despite Norman running qualifying times for both the 100m and 200m during 1971/72, the Australian Olympic track team did not send him to the 1972 Summer Olympics in Munich. It also documents Norman's reunion with Smith and Carlos, shortly before his death in 2006. This film screening has been organised by the Radical Film Network as part of the Radical Film Festival 6818, which runs throughout May to remember the tumultuous events of 1968 and that legacy relates to 2018. This screening has been sponsored by GMB Glasgow General Apex Branch and NUJ Glasgow Branch. The film will be briefly introduced by Kevin Buchanan (GMB Glasgow General Apex Branch), following the screening, there will be a short panel-led discussion with Layla Roxanne-Hill (NUJ Glasgow Branch), Dr David Archibald (Glasgow University), Ilisa Stack (Documentary photographer) and Melina Valdelièvre (STUC Black Workers Committee). Come along and support this important screening and learn more about the back drop to that most powerful of moments fifty years ago. Tickets are available from CCA on a sliding scale from £0.00 - £8.00 – the Radical Film Network aim to ensure that the cost of a ticket does not prevent anyone from attending.